Mere hours after the official unveiling of Silverlight 1.0 from Microsoft, Telerik has released the official version of its community supported RadControls for Silverlight 1.0. This release makes Telerik the first component vendor to deliver official support for the freshman Silverlight 1.0 release and highlights our commitment to this new framework. As we've discussed before, the Silverlight 1.0 controls from Telerik address the lack of basic controls in 1.0, adding buttons, media controls, labels, and the infamous spinning cube to the mix. These controls are free for all RadControl subscription holders and will be supported primarily through the forums (read the license agreement: "no dedicated support is offered for this product"). Telerik's work on the Silverlight 1.1 framework will be much more extensive and will be licensed separately from existing products. Watch for some early previews of the 1.1 controls later this year. I've already seen some of the controls in action and they are looking very good! 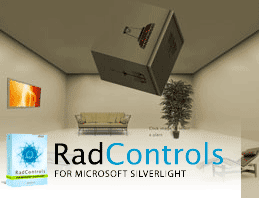 If you are a RadControls subscription holder and today's Silverlight release inspired you to create, jump over to Telerik.com, download your free Siliverlight 1.0 controls, and get started.